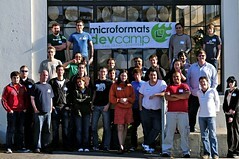 One month later, I wanted to share some observations about microformatsDevCamp and my thoughts about why it was so successful. Clearly, it all begins and ends with the people who participate: we were thrilled to have several dozen developers and designers drop in over two days. Over thirty folks went further and donated at the door, but more importantly, everyone contributed their time and enthusiasm. Applying the lessons of prior devCamps, the group proposed dozens of ideas and came together around 7 projects. Many of them ended up sharing their results as open-source on github; others created bespoke sites and yet other conversations impacted projects folks were already working on. Probably the only serious glitch was softwear-related; our initial rush t-shirt order didn’t turn out as we expected, so we’re spending a bit more to order new, higher-quality shirts. In the interests of transparency, we will be posting the full, final details online once those are printed and mailed out. Of course, an event of this magnitude requires more than just a volunteer labor of love: it takes real resources too. Huge thanks to our sponsors! The venue, hosted by Automattic, proved first-rate, with wonderful spaces for separate teams to collaborate, along with an awesome bar and views of the San Francisco Bay. Individual donors also pitched in personally, such as Carla Borsoi, Vice President, Research & Analytics at Ask.com; and Steve Ganz, Principal Web Developer at LinkedIn.com. Thanks also to Cindy Li for the wonderful microformatsDevCamp logo and buttons, and to Object Adjective for microformats stickers. PS. Check out more cool photos.